White base, irredescent pearl all over, transparent lighte blue on the shoulders, purple pearl back, pearl gold for the stripes, light blue for the stripes on the gill plates and mouth, paint with pearls violet shimmer and blue shimmer highlights all over, florescent orange throat and tail and black for the spot and eye shadowing. You nailed that one Joe ! Knew what it was before reading! Thanks Hokieangler. It's similar to the old mirrolure pinfish with a little more "bling" added to it.lol I hope the new owner catches some nice Redfish with it.Even though these WB blanks are not through wire constructed they are pretty tough. I tested some out by hanging about 30lbs of weight on 3 of them over night and only had one fail. Thet should hold up on slot size reds pretty good. A 50lb bull red may be a different story but we don't see them very much in our shallow water fishing. Mostly a live and cut bait deep water fishery for them here in NC. 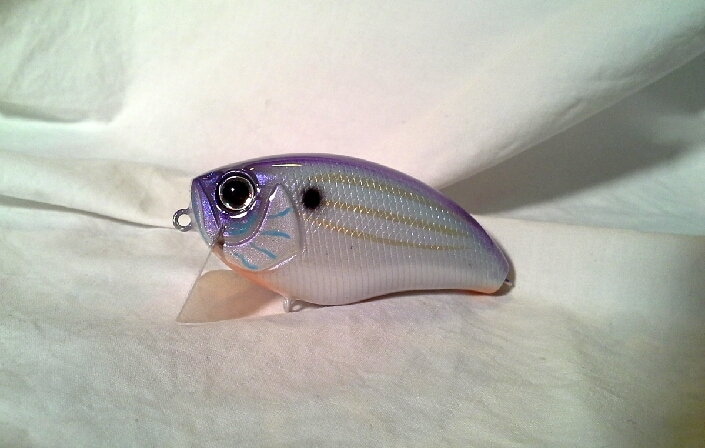 I painted some speck lures this color and they absolutely love it . It's become one of my favorite speckled trout color patterns! !! Nice work Joe!! Great looking baits! !